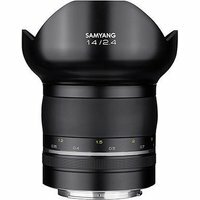 The Samyang 14mm f2.4 AE XP Lens is a premium, high-performance, manual focus prime designed for landscapes, architecture, and interior work. Its f2.4 aperture makes it a great choice for low-light conditions, and, with its 9 diaphragm blades, delivers beautiful bokeh when working with a shallow depth of field. This ultra-wide-angle lens delivers high-resolution images with edge-to-edge sharpness.